Living places are prone to accumulate a lot of rubbish quite quickly, leaving you with minimal space and a whole lot of useless stuff. If you are looking for a way to regain your place again, then turn to Go Rubbish Go. We are a Battersea house clearance company that has helped the residents and households in the area for over a decade. With our experience and unmatchable prices, we can help you get rid of the unnecessary stuff in no time. Whether it’s an outdated appliance, beaten up furniture piece or other type of junk, you can rely on our SW11 house clearance experts to remove it timely and effectively. Are you looking for a quick way to tackle your SW11 house clearance, while squeezing in to a tight budget? 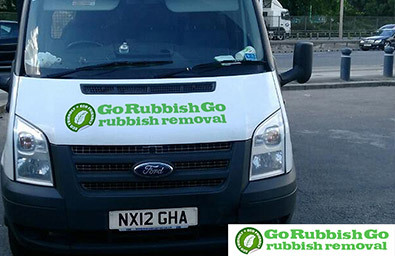 Go Rubbish Go is here to manage the tough job, without the costly rates and additional expenses. Our Battersea house clearance services are designed to suit your individual needs and save you money. Our simple and flexible pricing system is based on the volume of the waste we remove and the number of people you want to hire to complete the job. This means that you will not be assigned any other charges than what you need to pay for your house clearance in Battersea. Find out more about our affordable prices and lucrative deals on 020 8610 9182 today. To save you the time and the efforts of handling the complicated projects yourself, we put everything you need for a successful house clearance in Battersea at one place. Our company provides complete and efficient services suitable for any type of property or occasion. 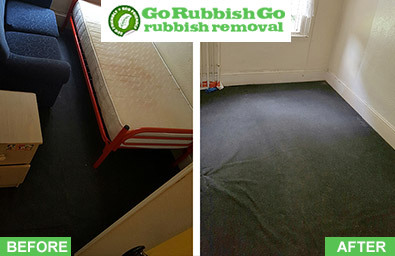 Whether you are moving out of your old flat and have a pile of junk you want to remove or you simply need to free up some space at home, you can depend on us to assist you with the difficult tasks. We know that each of our customers comes with individual needs. Our SW11 house clearance services are absolutely flexible and can be adjusted to your preferences. We always do our best to ensure that items from your house clearance in Battersea are recycled, reused or donated. Sustainable practices that minimise environmental pollution take place in our operations. One of the reasons why our SW11 house clearance rates are so competitive is because we recycle everything we can. Our dedicated and responsible experts will sort the goods they collect and will dispose of them appropriately. We work with accredited recycling facilities and a vast network of charity organisations. Once you contact us on 020 8610 9182, you can rest assured that your rubbish will be disposed of in the safest and most responsible way. Dealing with hoarded or cluttered homes can be challenging and overwhelming. Not for our trained and experienced SW11 house clearance team. 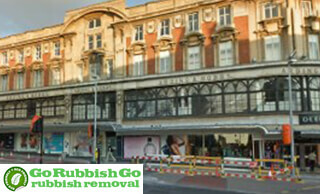 They remove just about anything, including old furniture, heavy appliances, garden waste and everyday household rubbish. Our specialists can collect the junk from anywhere in your property without a problem, leaving the place rubbish-free. Don’t worry about the bulky pieces and the heavy junk materials. Our excellent crew in SW8 will load them safely into the vehicle and will transport them to the closest facility. With our reliable and responsible Battersea house clearance services, you no longer need to worry about your rubbish! Why let the clutter stay in the way of having a perfectly neat and spacious property when you can use our professional low-cost SW11 house clearance services. All you need to do is reserve your appointment on 020 8610 9182 or fill in our online form. Our customer services staff will be glad to help out with any questions you may have on our Battersea house clearance services and will also provide you with more information about our eco-friendly methods of disposal. Furthermore they will also offer you a no obligations quote based on the things that need to be removed. Get your free quote now and see how much you can save with us! Battersea is part of the London Borough of Wandsworth in South West London but used to be a part of the home county of Surrey. It bears the SW11 and SW8 postcodes. The area is part of the south bank of the river Thames and has a few well-known landmarks, such as Battersea Power Station, Battersea Dogs and Cats home, Battersea Park, Shaftesbury Park Estate and Battersea Arts Centre. The area is accessible via Clapham Junction railway station or Battersea tube station, which you can reach via an extension on the Northern line.